We last spoke in 2007 about Beyond the Great Mountains (Chronicle, 2005). Congratulations on your new much-buzzed release, Wabi Sabi, written by Mark Reibstein (Little Brown, 2008)! Could you tell us how the book came to be? I was introduced to author Mark Reibstein by a mutual friend, author Roni Schotter. 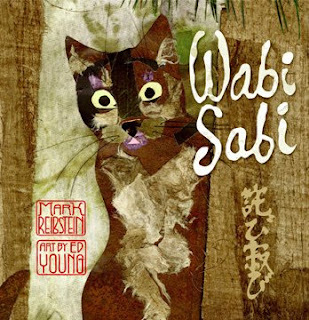 Mark had lived in Japan, where he had a cat named Wabi Sabi. He worked on the manuscript for many years. After he read my book, Cat and Rat (Holt, 1995), he thought I might be interested in collaborating. 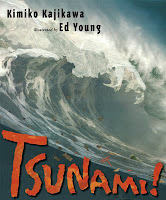 I liked the story, so I submitted it to a number of houses, but didn't have any luck until a friend, Molly Bang, suggested her editor at Little, Brown, Andrea Spooner, who passed it on to Alvina Ling, our editor. What was the timeline from your accepting the manuscript to its publication? What were the major challenges along the way? Since the story of Wabi Sabi is a journey, I chose a horizontal design in an accordion format (like Mouse Match (Harcourt, 1997)), and worked in ink, pastel and collage. Because of the Japanese words and the complexity of haiku and text, the book evolved into a vertical design with a hinge on top. The final art was near finished in April 2007, when my wife suddenly became sick and needed immediate surgery. Knowing that the months after that would require my total attention, I turned in the art in April, although the deadline was November. When my wife was released from the hospital, I discovered that the art had been lost in transit. I was unable to follow up on it until after my wife's memorial service. By July, after many failed attempts to recover the art, I decided to start anew. All of my preliminary sketches and collage materials had been discarded in April. It was a miracle that I was able to condense two years of work into two months. What's more, the second version was superior by far. The strange thing was that the package containing my first version mysteriously turned up after the second one had gone to press. So, now we have two versions of art for the same book. - Every object has intrinsic beauty. It is up to us to discover that beauty by suspending our own bias and seeing the object as it is. - No book is ever finished, for it can, given more time, always be made better. Be persistent. Moon Bear by Brenda Z. Guiberson (Holt, Spring 2010). I'm also currently working with Chronicle on a riddle book for young children (title undecided, Spring 2010).